Network Executive Director, Mohamed Elsanousi recently concluded his trip to Thailand to meet with leaders, activists and students regarding interreligious dialogue, inclusivity and peacemaking. Between meetings, lectures and student-engagement sessions, Network Executive Director Mohamed Elsanousi has had an exciting visit to Thailand to discuss interfaith dialogue, inclusivity and peacebuilding. 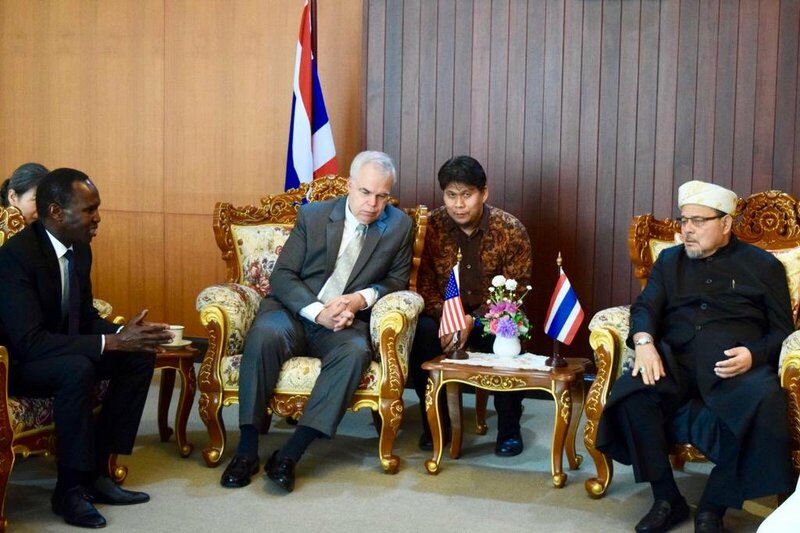 Elsanousi began his trip with a meeting between the Sheikhul Islam of Thailand, U.S. Embassy representative, Peter M. Haymond, and himself. This timely meeting pertained to the discussion of the multiple religious groups within the region, including the Muslim community in Thailand and the wider South and Southeast Asia. Mr. Elsanousi also provided an introduction to the Marrakesh Declaration as it serves as a powerful resource to legitimize and advocate for minority rights and equal citizenship within the Muslim community. Network Executive Director Mohamed Elsanousi at a meeting with the Sheikhul Islam of Thailand and U.S. Embassy representative. 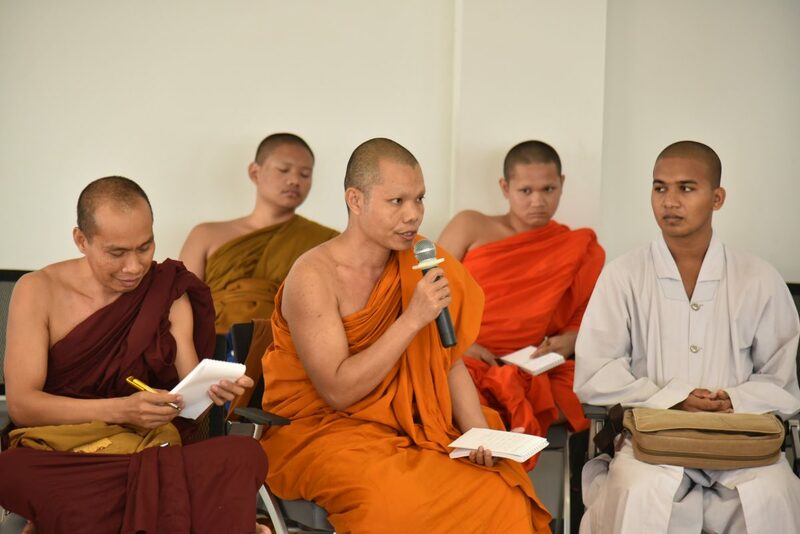 Elsanousi was also invited to lead a lecture and workshop for 20 Buddhist Monks and students in interreligious dialogue and sustainable peace at Mahachulalongkornrajavidyalaya University in Ayutthaya, Thailand. The lecture and workshop not only informed students of peacebuilding, but offered practical suggestions on how these students, and individuals around the world, can play an active role in grassroots peacebuilding in their communities. Elsanousi’s message surrounding the need to promote peace through non-violent actions. His concept is clear: peacebuilding cannot be effective if we do not (1) accept and respect the different views, beliefs and ideas of our neighbors and (2) have a platform for open communication between communitiy members. The organization of, and participation in joint community events will allow different faiths and communities to engage in conversation and collaborative action. Planning a community event is a great way to bring together diverse religious communities and create ideas of mutual understandings. Speak out against harmful speech. As we live in a globalized world, information dissemination occurs rapidly. Any form of hate speech must be addressed before a negative message spreads and incites potential violence. Learn about different religions not from a book or the internet, but rather, talk to those of different faiths and religions. An open-dialogue and mutual understanding can be developed through communicating with those in your own neighborhood and community. The presented ideas above are methods of preventative action. Bringing together communities and engaging in honest and open dialogue reiterate the idea of joint communication which is a strong tool for conflict prevention. Elsanousi concluded his time at the University by offering his praise to three female leaders who have offered their assistance to, and demonstrated solidarity with, religious communities. He recognized the PM of Bangladesh, Sheikh Hasina, and German Chancellor Angela Merkel for welcoming all refugees. He also acknowledged the Prime Minister of New Zealand for her inclusive approach to addressing the Muslim community since the Christ Church attacks. These female leaders are strong examples of how one can recognize different communities and exhibit solidarity in troubled times.